There is anger in the ruling APC and the Presidency. Moves to reconvene the National Assembly remained unsuccessful yesterday, even as the row sparked by the long recess grew. Senate President Bukola Saraki and House Speaker Yakubu Dogara said there was no agreement that the National Assembly should reopen. 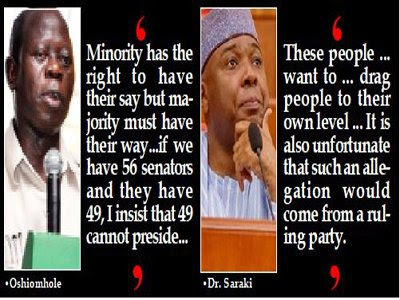 Saraki is chairman of the Assembly. What is he up to? APC leaders in the National Assembly insisted that there was an agreement to reopen the Assembly. House Deputy Speaker Yussuf Lasun, Senate Leader Ahmed Lawan and House Leader Femi Gbajabiamila said presiding officers must reconvene the Assembly immediately to avoid any form of sabotage, which will not augur well for the APC. 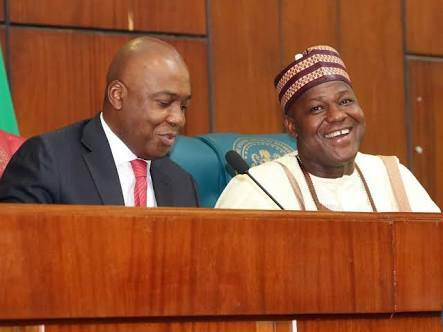 Saraki and Dogara said that no date was fixed to reconvene the two chambers of the National Assembly to consider the budget for the 2019 elections. But the failure to reconvene the National Assembly, to the APC Assembly chiefs, could spark a constitutional crisis that will pose a potential threat to the current democratic dispensation as it will affect the preparation of the Independent National Electoral Commission (INEC) for next year’s elections. Speaking at a meeting with the members of the National Working Committee of the party in Abuja, Lasun, Lawan and Gbajabiamila said presiding officers must reconvene the Assembly immediately. House Speaker Dogara did not attend the meeting. The Deputy Speaker said it was unfortunate that the National Assembly could not reconvene on Tuesday as earlier agreed by the presiding officers. Lasun asked the leadership of the party to make good on their promise not to abandon the legislators, saying: “We are party members and I must say that I like the assurance of the chairman that members are not going to be abandoned because it is always very hot outside there. Lawan said the APC Senate Caucus and the House caucus would ensure that the constitutional crisis hanging in the air is averted by ensuring that the Assembly reconvenes to pass the budget of INEC. Lawan said “We have been talking and yearning for the National Assembly to reconvene, but it appears to be a dream. The deputy speaker had informed us a few days ago that we may reconvene either today or tomorrow. Well, tomorrow is yet to come. “We are insisting that the National Assembly reconvene and reconvene quickly so that we pass the budget request of Mr President for INEC to start its preparation for 2019 in earnest. We also need to pass the request by the Federal Government for loans from foreign countries which will be the only basis for now for the funding of our capital budget. “To do otherwise would amount to sabotage because we are in a very unusual time; we have the leadership of the National Assembly divided between the opposition PDP and the APC. We have to work hard to ensure that our government is not sabotaged. “If we don’t pass the budget request, it serves the PDP very well, but it doesn’t serve us at all because it will negate what we stand for and all the promises we made to Nigerians. In fact, it could spark a constitutional crisis because if INEC is not able to conduct the election in 2019, that will be a serious constitutional crisis. Gbajabiamila said: “We have to find a find a way of reconvening the Assembly because as it is, we are heading for a constitutional crisis and an inevitable government shutdown because the two things that need to be done if the budget for the election and the funding of the capital project and without the approval, that will be difficult. “I was with the Minister of Finance a couple of weeks ago and she told me in no uncertain terms that if she does not get the necessary approval from the National Assembly by end of August, we should forget funding for the capital budget. That is why I said it is a task that must be done. “A lot of our members are supposed to be in Saudi Arabia right now. “We had to go to the Hajj Commission to have their flight delayed because today was supposed to be the last day. They agreed to delay the last flight till Thursday, with the hope that we will reconvene today and tomorrow and do what is necessary.